Banks and NBFCs (Non-Banking Financial Companies) are the key financial intermediaries and offer almost similar services to customers. The basic difference between banks & NBFC is that NBFC cannot issue cheques and demand drafts like banks. Banks take part in country’s payment mechanism whereas Non-Banking Financial Companies are not involved in such transactions. NBFC came into both in public and private sector to complement banks in providing finance to people because banks cannot cater all the sections of the society alone as finance is the basic requirement of the all the individuals and businesses. Non-Banking Financial Company is a registered company which is regulated by the Reserve Bank of India under RBI Act, 1934. NBFCs are not banks, but their activities are related to lending and other activities such as providing loans and advances, credit facility, savings and investment products, trading in the money market, managing portfolios of stocks, transfer of money, etc. Their activities are concerned with hire purchasing, leasing, infrastructure finance, venture capital finance, housing finance, etc. 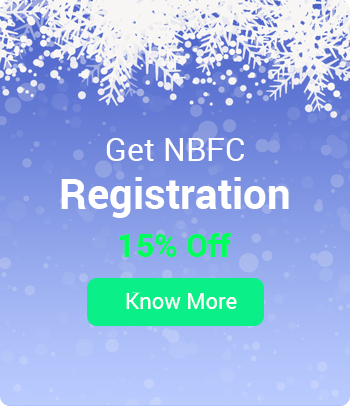 NBFC can accept deposits, but only term deposits and deposits repayable on demand are not accepted by NBFC. Here are the following examples of popular NBFCs such as Kotak Mahindra Finance, SBI Factors, Sundaram Finance, ICICI Ventures. Banks are the financial institution which is authorized by the government to conduct banking activities such as accepting deposits, granting credit, managing withdrawals, pay interest, clearing cheques and providing general utility services to the customers. Banks are considered an apex organization which dominates the entire financial system of the country. They act as a financial intermediary between the depositors and borrowers. Banks ensures smooth functioning of the economy in the country. 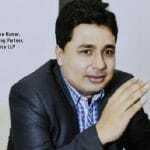 They can be public sector banks or private sector banks or foreign banks and also responsible for making loans, creating credit, mobilization of deposits, safe and time bound transfer of money and providing public utility services. Its ownership lies with the shareholder and they operate with the profit motive. Banks are the government authorized financial intermediary that aims at providing banking services to the general people. Whereas NBFCs provides banking services to people without carrying a bank license. An NBFC is incorporated under the Companies Act whereas a bank is registered under the Banking Regulation Act, 1949. 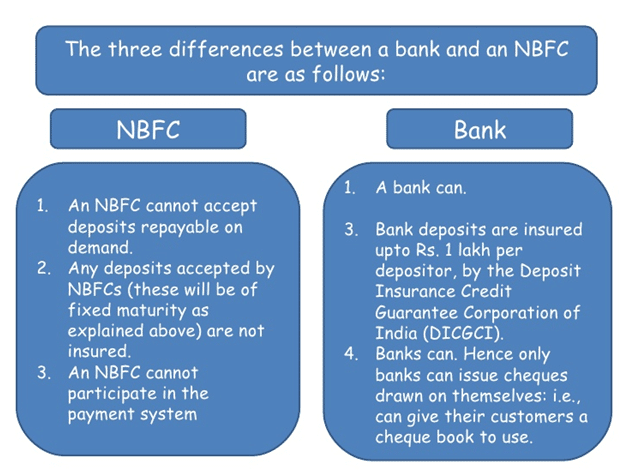 NBFCs are not allowed to accept deposits which are repayable on demand whereas banks which accept demand deposits. In NBFC, foreign Investments up to 100% is allowed. Whereas in the case of private sector banks they are eligible for foreign investment, but which would be not more than 74%. Banks are an integral part of the payment and settlement cycle while NBFC is not a part of this system. It is mandatory for banks to maintain reserve ratios like CRR or SLR. Whereas in the case of NBFC it is not required to maintain reserve ratios. Deposit insurance facility is allowed to the depositors by Deposit Insurance and Credit Guarantee Corporation (DICGC). In the case of NBFC, this type of facility shall not be available. 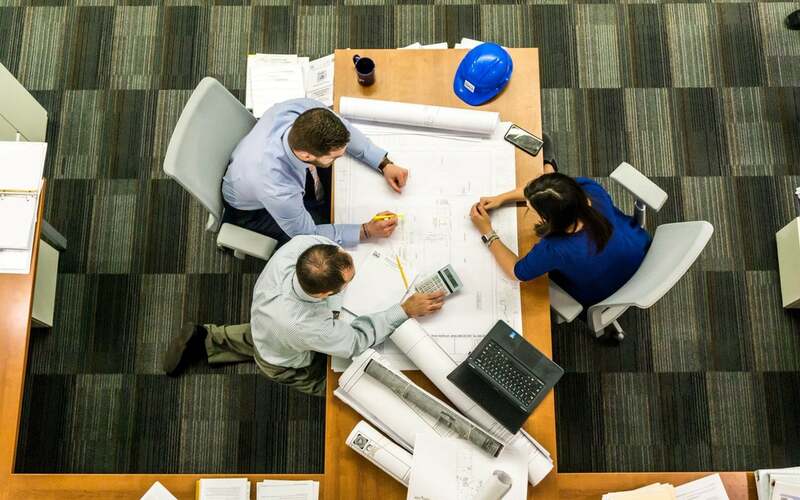 Meaning They provide banking services to people without holding Bank License It is government authorized financial intermediary which aim at providing banking services to the public. The main objective for which NBFC’s are established is to grant credit to the poor section of the society whereas the banks are the financial intermediaries authorized by the government to receive deposits and grant credit to the public. Licensing requirements of a bank are more stringent in comparison to NBFC. Banks cannot operate any business other than the banking business whereas an NBFC can operate such business. For more information send us an email at info@enterslice.com. You can also call our customer support at +919069142028.